One of the last of its type in existence, this was a powerful one-owner logging saddletank engine. This 2-8-2T Mikado “Minarets” road engine (named after the lumber company to first order this type locomotive) carries 2,500 gallons of water for steam in a saddletank astride its boiler, and 500 gallons of fuel oil in a tank on its frame behind the cab, instead of in a tender. Not having a tender gives it good rear visibility, helpful in logging and switching operations with frequent backing moves. ALCo builder’s No. 68276, it weighs 196,000 lbs. (98 tons), has 20″ x 24″ cylinders, 44″ driving wheels, a 190-lb. boiler pressure (originally 200), and a tractive effort of 35,200 lbs. 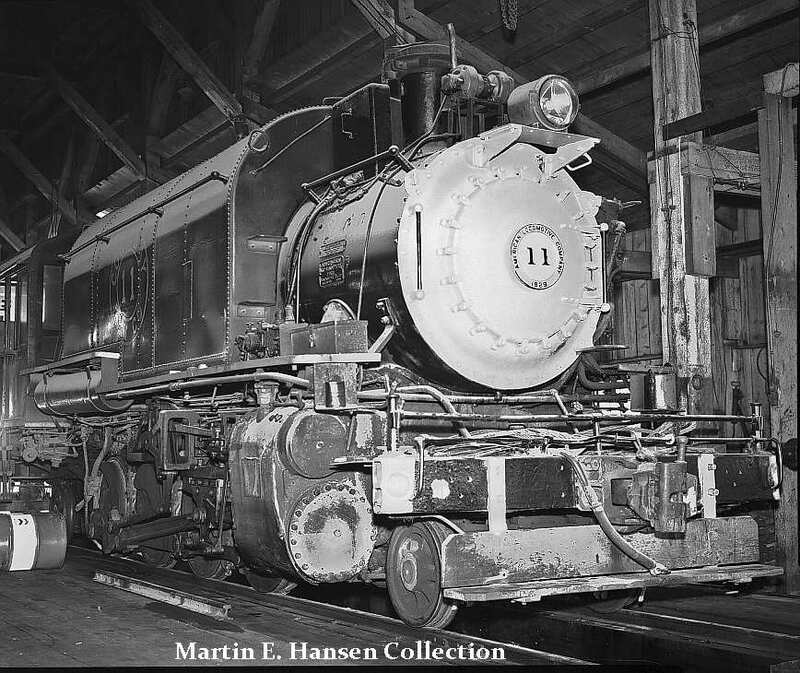 The locomotive went new to Coos Bay Lumber Company of Powers, Oregon as No. 11. 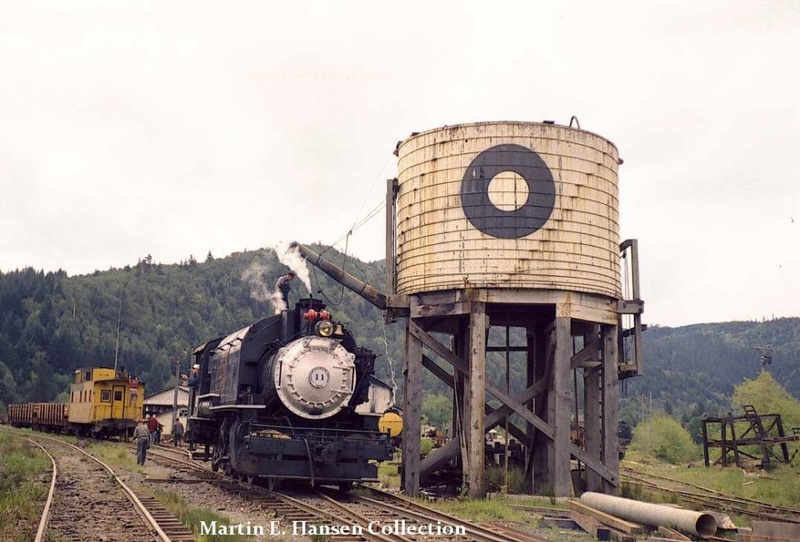 It was used in timber operations and along a 45-mile Southern Pacific branch between Powers and Marshfield (now Coos Bay), via Myrtle Point and Coquille in southwest Oregon. Lyle McCulloch, Sr., who worked on the line from 1925-71 (as engineer after May 1934), often operated CBL No. 11, and was fireman on its first run in 1929. While in log-hauling service, CBL No. 11 often hauled cars up a 12-mile 5.5% grade (including 1,000 feet at 6%) with a maximum curvature of 18 degrees, to the Eden Ridge area. It also took up to 63 loaded cars on a 44-mile line from Powers to a company mill. Because of the curvature of the hill lines it worked on, CBL No. 11’s bearings (usually those on the main rods) often got very hot. It was retired from log-hauling in early 1951 and used mainly in yard operations. In July 1956, Coos Bay Lumber was purchased by the Georgia-Pacific Corporation, becoming its Coos Bay Timber Division. Diesels then replaced steam, and CBL No. 11 was used only in standby service. It pulled its last train at Myrtle Point’s Centennial in July 1962. In November 1967, CBL No. 11 was donated by Georgia-Pacific to the PSRMA. 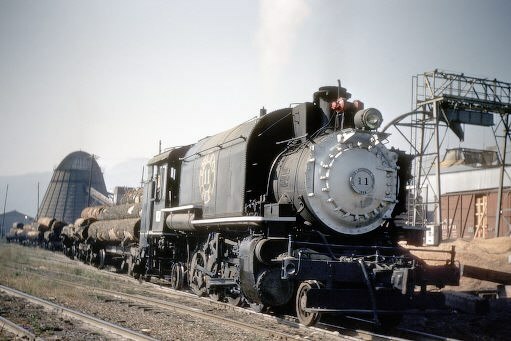 It left Powers June 17, 1968 on its own wheels, but when it derailed three days later and was declared “untrackworthy” by the SP, it was loaded on a depressed-center flatcar and carried to San Diego, arriving August 3rd. It was unloaded at Santa Fe’s Marine terminal by Owl Company cranes. Later moved to the Miramar Naval Air Station, it was repaired and repainted by museum volunteers, and named for John A.”Nick” Nichols, their spirited leader. In 1976 it became part of the Museum’s Bicentennial exhibit at B Street and Harbor Drive in San Diego, and in October 1976 was used with two Museum passenger cars in filming Universal Pictures’ MacArthur with Gregory Peck at the Santa Fe Depot in San Diego. Moved to San Ysidro by the SD&AE, CBL No. 11 was brought to Campo in July/August 1983 on the museum’s first “Great Freight”. The engine was rehabilitated by Museum volunteer workers, and steamed up for the first time in 22 years on Memorial Day in May 1984. It’s since had more repairs, a 1985 repainting/relettering, and has been steamed up on other occasions. CBL No. 11 is now displayed in the Museum’s yard, and is currently under restoration. On May 7 of 1961, Coos Bay #11 takes on water and oil outside the shops at Powers, OR in preparation for taking a group of Boy Scouts on a train ride. Photo by R. E. Burke – Martin E. Hansen Collection.